I thought I would start with the earliest references I have been able to find about Flotta, beginning with various mentions of an ancient church. In the statistical account of 1845 the Minister of Walls and Flotta wrote that there was supposedly a long house or church on the island where the clergy of the surrounding area would gather together. During the Victorian era the Flotta Stone, a sandstone slab bearing a Celtic cross, was found in the ruins of what was believed to be an ancient church (Could this be the same church that was mentioned in the Statistical Account?). Dating from about the eighth century, it was eventually bought by the Museum of National Antiquities in Edinburgh; which is now the Museum of Scotland. Brief mention should also be made of a paragraph in an old Orkney guide book of the mid 1900s. Its contribution is interesting, saying that the Presbyteries of the North of Scotland met at a church near where the present Flotta Kirk stands and that the church building was surrounded by three crosses, one of which can be seen in a wall adjoining the present churchyard. It also mentions that there are two burial mounds, or tumuli, on Flotta. In regard to these I have yet to find another mention. One other reference to Flotta’s ancient past should also be noted and that’s the islands name itself. The word Flotta comes from the Norse and means ‘Flat Island’. In truth Flotta has a gently rolling landscape but compared to its neighbour Hoy, which has at least one steep hill, it might be considered flat in comparison. The name tells us that all those centuries ago Flotta was known to the Vikings. Flotta is not mentioned in the Orkney sagas, there is no great Flottarian Viking known to us but, like other Orcadians, Flottarians must have lived through the comings and goings of Eric Bloody-axe, Ragnhilda and Thorfinn the Mighty. There are more references to Flotta in recent times. In the mid 1700s the infamous laird of Flotta Sir James Steuart of Burray was named in court by Christian Ritch as being the father of her unborn child and that it was ‘begot in the pan house of Flotta’. He later smuggled her out of Orkney and the case was dropped. Sir James had 19 tenants on Flotta. He had become infamous when present at the murder of Captain James Moodie of Melsetter, in Kirkwall in 1725. 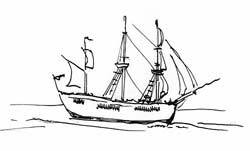 On the 1 May 1770 Forby Sutherland, believed to have been a Flottarian, had the dubious distinction of being the first European to be buried in Australia. He was a member of Captain Cook’s crew on his Endeavour Expedition. Forby died of Tuberculosis onboard ship while they were anchored at Botany Bay. They buried him on shore and a nearby headland was named Sutherland Point after him. His story yet again shows Flotta’s quiet presence on the canvas of history. Flotta really came to the fore in historical terms during the two World Wars. With the First World War came the signalling station at Stanger Head, the YMCA building where troops could enjoy a round of golf and St Vincent’s Pier used by the navy. The two main events connected with this time in Flotta’s history are the landing of King George V in July 1915 to inspect the troops which happened at Kings Hard, Stanger Head and the famous boxing match of which there was an audience of 10,000 people. A tragic event also occurred near the island on the 9 July 1917. The HMS Vanguard blew up off the coast of Flotta killing more than 800 people. The island was showered with debris including a 400 ton 12 inch gun turret. Burning debris from the ship set the heathland of Golta alight. With the sinking of the HMS Royal Oak at Scapa Flow many years later, in October 1939. Flotta once again became a military base. During the Second World War a cinema was built (in which King George VI was at one point an audience member), rocket batteries were put in place to defend the skies from enemy aircraft and two further piers were constructed; Sutherland pier and Gibraltar Pier. Like other British subjects Flottarians had also signed up to fight for King and Country during the two world wars; a memorial to those who died can be seen in the Kirk. Flotta had undergone massive upheavals during those two wars, but the biggest change to its geography and status came in the 1974 with the building of the Oil terminal. Taking three years to complete, the terminal was built to blend into the landscape and received several awards for its environmental approach. The Flotta flare, of which it is a part, has become a well known landmark. Tony Benn, the then energy minister, represented the government at the opening of the terminal in 1977. Margaret Thatcher visited in September 1980 and the Queen Mother was also to visit in 1992. 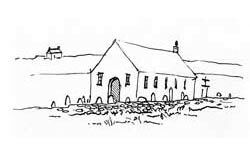 In recent years this little island in the archipelago of Orkney has paid host to concerts in its little Kirk during St Magnus Festival and in 2004 has held a charity walk on the island in aid of Diabetes Research. A brief mention should be made of the many Flottarians who published works of poetry, biography and even science. Flotta has a rich history in this department considering its small population and has had more than its fair share of writers. These include James Hay who wrote many poems including ‘Roon Flotta’s Isle’ which was used in Orkney’s tourist information brochure of 2000, David Sinclair who published Willick and the Black Black Oil, and Sutherland Simpson who published Elementary Human Physiology and was an extremely well known and distinguished Professor in the USA. A full list of them can be found on the book page. Finally in regard to music: mention should made of the well known tune ‘Flett from Flotta’. Written by Donald Macleod during the Second World War about his friend William (aka Jock) Flett, a piper in the Seaforth Highlanders, and inspired by a piece of melody from Flotta; this has become the staple of many pipe bands. I now believe that the Codex Flotticensis referred to in some histories of the island is most probably a manuscript called theFlateyjarbok. It was owned by a Jonas Torfason who lived on the island of Flatey (Flat Island), Breidafjördur Bay, Iceland; not Flotta as sometimes claimed. I may write about the reasoning for this, at a later date. My thanks to a certain individual for clarifying the situation. Anon. Orkney Official Guide Book. The Simmath Press, date unknown (Blue front cover features black and white photo of Kirkwall Harbour). Anon. ‘William A. Flett from Flotta’. Piping Times. Vol 50, No5, (Feb 1998): p.39. Brown, Malcolm and Meehan, Patricia. Scapa Flow. Pan Books, 2002. Fleming, Maurice.‘Life is Good on Flotta.’ The Scots Magazine. New Series, Vol. 87, No. 1 (April 1967): p.41-52. Gunn, John. The Orkney Book – Readings for Young Orcadians. London: Thomas Nelson & Sons Ltd., 1909? Orkney Tourist Board.‘Flotta.’ The Islands of Orkney 2000 information & travel guide. p.12-5. Schei, Liv Kjørsvik. The Islands of Orkney. Colin Baxter Photography Ltd, 2000.